For the second day in a row, the regime’s bombardment in and near Aleppo — which escalated December 14 and killed more than 400 people over 12 days — eased. 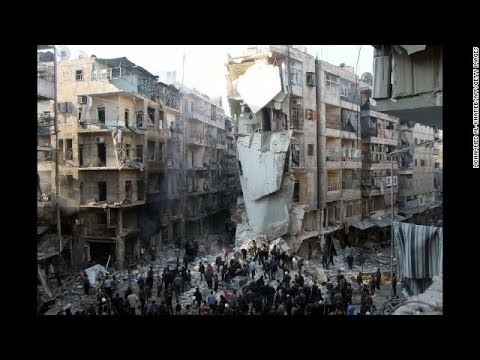 However, the Local Coordination Committees reported that 89 people died across Syria on Thursday. Of the dead, 43 were in Damascus and its suburbs, with 14 in Aleppo Province. The Violations Documentation Center has recorded 82,648 deaths since the conflict began in March 2011 — 61,157 of them civilians. The reason for the Syrian military’s surge in bombing two weeks ago is still unclear. The army, which had made gains east of Aleppo last month, notably with the capture of the gateway city of as-Safira, has been increasing pressure to hold onto the territory and keep supply lines open to its areas of Aleppo city. There’s sadness inside us, but we raised the flag because nobody helped us, nobody extended their hands to us. We are ready to save the lives of [hungry] children. There’s no bread in Moadamieh. For three months, there’s been not even a grain of rice. Under the agreement, the military raised the regime flag over Moadamiyyet. The army also demanded that heavy weapons be handed over and that only registered residents be left in the town. [The residents] will carry weapons and set up checkpoints to prevent the entrance of strangers who came from around the world to destroy our country. The leading Kurdish militia YPG now has 35,000 members, according to a spokesperson for the group. Redur Khalil said the YPG, affiliated with the political movement PYD, had grown after a recent general mobilization. In recent months, the YPG has been in a series of clashes with insurgents, taking territory and some towns in northern Syria. The PYD has called for an autonomous Syrian Kurdistan.